The Millennium Ecosystem Assessment identified the regulating services as amongst the least understood but potentially most valuable services offered by ecosystems. This lack of understanding of regulating services has been a major reason for the overexploitation and degradation of ecosystems. The value of regulating services is best determined through an economic production function approach, which derives the value of regulating services as intermediate inputs into other economic goods and services. We used existing scientific knowledge and data sourced from existing scientific databases and studies to develop and demonstrate empirical production functions that measure relationships between ecological infrastructure and the economy in fisheries in KwaZulu-Natal, along the east coast of South Africa. We applied econometric analyses - a technique that allows for evidence-based analysis of observed data, based on existing scientific knowledge. Our work demonstrates that existing scientific databases may contain useful evidence of relationships between ecological infrastructure and the economy, and that decisions need not always wait for the results of controlled experiments. The lack of understanding of regulating services has been the major reason for overexploitation and degradation of ecosystem assets and the ecosystem services they provide to humans.1,4-7 Dasgupta8 attributed this exclusion to a historical propensity by mainstream development economists to judge ecosystems as luxury goods which would improve as wealth improves, as well as to the low visibility of continuous ecosystem degradation. In addition, Perrings9 described several typical weaknesses in environmental economic study approaches. One of the most significant weaknesses was that most of these studies focused primarily on the direct use values of the environment, and put comparatively little effort into understanding the indirect linkages among ecological functioning, ecosystem services and the production and consumption of other economic goods and services. In order to address these problems, the MEA1,5 and The Economics of Ecosystems and Biodiversity6 (TEEB) initiative introduced a new way of thinking about the value of biodiversity as a life-supporting system underlying the benefits provided by ecosystem services to human society. Central to this approach is the definition of the concept of ecosystem services. TEEB defines ecosystem services as the direct and indirect contributions of ecosystems to human well-being. TEEB distinguishes among four types of ecosystem services: provisioning, cultural, regulating and supporting services. Provisioning services describe the material or energy outputs from ecosystems. Cultural services include the non-material benefits people obtain from contact with ecosystems. Regulating services are the services that ecosystems provide by acting as regulators. Supporting services underpin almost all other services through their function of providing living spaces for humans, plants and animals. Regulating services play an indirect role in the economy and mitigate environmental risk. There is consensus amongst the professional community of resource economists that an economic production function approach is best suited as a valuation method for intermediate ecosystem services. These production functions quantify values for ecosystem services that contribute at least part of the value of those resources. They would apply knowledge of ecosystem functioning and processes to derive the value of supporting and regulating ecosystem services. They do this through deriving the value of ecosystems and the services they provide as intermediate inputs into goods and services that are produced and consumed by economic agents.9-14 An ecological production function considers an ecosystem service as a dependent variable (or response variable), and one or more ecosystem component and/or process indicators as independent variables (or influencing factors/determining variables). ...[Composition has to do with the identity and variety of elements in a collection, and includes species lists and measures of species diversity and genetic diversity. Structure is the physical organization or pattern of a system, from habitat complexity as measured within communities to the pattern of patches and other elements at a landscape scale. Function involves ecological and evolutionary processes, including gene flow, disturbances, and nutrient cycling. In this study, we applied the ecosystem services framework and used the concepts of composition, structure and function of an ecosystem to formulate and demonstrate production functions to link ecological infrastructure and biodiversity to the economy, in the form of a case study. The practical challenge in so doing lies in the application of an economic technique known as econometric analysis. This technique allows for evidence-based analysis of multiple variables. Econometrics requires the application of time-series or cross-sectional, observed data for assessing economic theories, in this case resource economic theories, based on existing scientific knowledge. Econometrics most often employs regression analysis, as the data available are most often not sourced from controlled experiments. The advantage of this type of analysis is that it provides information on the extent to which society indirectly depends on components of ecosystems and the degree of risk that society is exposed to when ecosystems degrade. Thus, using existing scientific knowledge and data sourced from existing databases and studies, we developed and demonstrate empirical production functions to measure such relationships in KwaZulu-Natal (KZN) fisheries along the east coast of South Africa as a case study. Marine and estuarine systems are demonstrated separately. Various studies have quantified the economic size of these fisheries, both in estuarine and marine ecosystems.20-23 These studies report various economic indicators, for a variety of years, and use different valuation techniques. A combined analysis of the work done in these studies indicates that the size of the total fisheries industry may vary between R900 million and R1400 million per year, measured in terms of the industry's contribution to the gross domestic product (GDP). The variation results from changes in catch and in input and output prices, which vary from year to year. Interestingly, the largest component of this industry is recreational shore and boat fishing (in estuarine and marine systems), for which the expenditure on fishing tackle and the associated travel cost contribute significantly. Another very significant contributor is subsistence fisheries, whose contribution to GDP is a form of economic externality as the activity takes place in the informal economy. Such scientific knowledge creates an important starting point for the development of ecological production functions. In this study, we adapted the MEA and TEEB frameworks of ecosystem services, both of which broadly define two sets of services - those that are directly consumed as final products in the economy (direct benefits provided by provisioning and cultural services) and those that are used as inputs in generating products for final consumption (intermediate benefits provided by regulating and supporting services). By comparison, economic valuation techniques for intermediate ecosystem services are less developed. The production function approach has been the most common model for valuing the marginal contribution of intermediate ecosystem services. In the following sections we develop ecological fishery production functions based on the three elements that constitute the concept of biodiversity: function, composition and structure. where St is an indicator of biological production, and Nt is an indicator of nutrient load in the fish production system. where St is an indicator of biological production, Nt is an indicator of nutrient load in the estuarine system, TYPE is an indicator of the degree of openness of the estuary, HAS is a vector of habitat types (shallow sub-tidal sand, mud flats and mangroves) preferred by various fish species and COND measures anthropogenic disturbance and its resultant degradation of system quality. where SPEC t is an indicator of species abundance in the estuarine system. We employed the above analytical framework to specify an empirical model to measure the relationship between the recreational fishery and the compositional and structural elements of estuarine biodiversity. Although the analytical framework developed above implies that Equations 1 to 4 represent a system of interlinked processes and responses, unavailability of appropriate data necessitated separation of the empirical analysis into two components in empirical specification and implementation. The first component analyses the functional effects of terrestrial nutrient deposition on the commercial marine linefishing industry. An excellent data source is the fish egg database on the website www. fisheggsandlarvae.com.24 This time-series data forms part of a 24-year sampling record of spawning patterns of fishes with pelagic eggs, on the inshore shelf within 5 km of the coast, along a short section of the KZN coastline 50 km south of Durban.19 The data set also includes mean annual run-off (MAR) data suitable for the purposes of analysing the relationship between nutrient influx and fish egg biomass.25 We thus use time series data on run-off available from a different source coupled with corresponding information on an alternative index of fish biomass (i.e. fish egg abundance) to empirically specify and measure nutrient loading influences of run-off as a separate component. The second component of the model employs cross-sectional data to capture effects of the other elements of biodiversity - in this case, the compositional estuarine ecosystem elements influencing fish productivity. Two data sets containing cross-sectional data collected independently by two research teams from sub-sets of the east coast sub-tropical estuaries of South Africa are available. One data set was compiled by Dr George Begg and was published in hard copy as The Estuaries of Natal volumes 132 and 233. These data were based on extensive environmental monitoring carried out on 72 estuaries during the late 1970s and early 1980s. A second data set was compiled by Dr Trevor Harrison for the State of SoUth African Estuaries report for the Department of Environmental Affairs in 2000.36 Harrison evaluated 47 estuaries along the KZN coast. The combined Begg-Harrison cross-sectional data comprised more than 120 measures of various estuary components and processes. Both Begg and Harrison conducted extensive biological sampling and recorded the abundance (biomass) and number of fish species in the surveyed estuaries. Several other compositional and structural characteristics of KZN estuaries were included in Begg and Harrison's cross-sectional data. Key among these measurements are: (1) estuary depth and shoreline length used as proxies for the extent of tidal flat area; (2) the type of estuary, reflecting the degree of openness of the estuary; and (3) rating of the general condition of the estuary. These variables all have important functions in the production of estuarine ecosystem services. The degree of openness measures the connectivity of an estuary to the marine ecosystem. Highly connected estuaries (i.e. those that are open for 12 months of the year) will be more productive than estuaries that are only temporarily open, and would be expected to have higher species richness. The shoreline length (in kilometres) and area of shallow sub-tidal flats (in hectares) are both measures of habitat area. The condition of the estuary is rated through an index, which measures its general health and levels of human disturbance (e.g. pollution and physical alterations). Begg also provides measures of terrestrial run-off, either directly as river inflow into estuaries or indirectly as catchment areas which, with MAR, can yield run-off values. The Begg-Harrison data also contain a measure of dissolved oxygen (in mg/litre), which is indirectly proportional to nutrient content as higher levels of dissolved oxygen in these estuaries are commonly associated with poorer nutrient load conditions.37 More dissolved oxygen is primarily a result of larger systems which are open and subject to marine flushing, rather than related to nutrient concentration. A notable difference between Begg's and Harrison's data sets relates to their fish sampling gear: Begg used a small beam trawl while Harrison used a variety of nets including seine nets and gill nets (Connell A 2013, oral communication, March 06). We therefore used only the Harrison data set for fish species and abundance data, with data standardised to a catch per unit effort. where BIOMF measures the total weight of fish caught in grams per sample in estuary i; SPECSj is the number of fish species in the sample from estuary i, CONDj is an index of the condition of estuary i measured through the Harrison-Whitfield multimetric estuary index25 and SHRLNj measures the length of the shoreline of estuary i (in metres). TYPEi is an index that refers to the classification of estuary as defined by the Whitfield physical classification of estuaries (see Table 1), NUTRI, is an index of the nutrient capacity of the estuarine system and was calculated by dividing the catchment area (in km2) by the volume of the estuary waterbody (in m3), and are model parameters and and are the residual error terms. Equation 7 specifies the biological production of fish to be a function of the number of species present in the system (diversity composition effect) and the estuary type. In Equation 8, the number of species present in the system (species richness) is modelled to vary with differences in key ecosystem component and process variables: estuarine condition as measured by the Harrison-Whitfield multimetric estuary index is a good indicator of the overall ecosystem health of an estuary.38 Shoreline length is a proxy for the extent of tidal flat area, which is an indicator of the area of shallow sub-tidal flats, which is important fish feeding habitat. Estuarine type is important because larger estuaries that are permanently open to the sea generally provide more diverse habitat and improved connectivity between marine and estuarine habitats, and thus allow for a greater number of fish species. Nutrient cycling is important because estuaries with larger catchment areas (within the same metasystem) would produce more detritus and are more likely to flush the estuary. The NUTRI variable also indirectly captures effects of run-off on nutrient capacity, as a larger catchment area is expected to have a higher MAR and thus higher nutrient input. The empirical relationship between run-off and spawning intensity was estimated using linear and Cobb-Douglas functional forms. The linear form function gave the best statistical performance (Table 2). The results show that nutrient input into the system in the current period t, combined with lagged effects of nutrient input over the preceding 2 years (t-1 and t-2), explains 97% of the variation in St (fish egg abundance) (Appendix 1). However, the effect of a one-period lag (Mt-1) was not statistically significant and hence estimation results for the statistically significant two-period lag are reported in Table 2. Both coefficients indicate a strong positive correlation between run-off and spawning intensity. The lagged effect is consistent with the life-cycle characteristics of fish, which reach spawning maturity after 12-24 months. It should be noted that the improved condition of the spawning adults in the population, resulting from improved nutrition, contributed to the increased spawning. 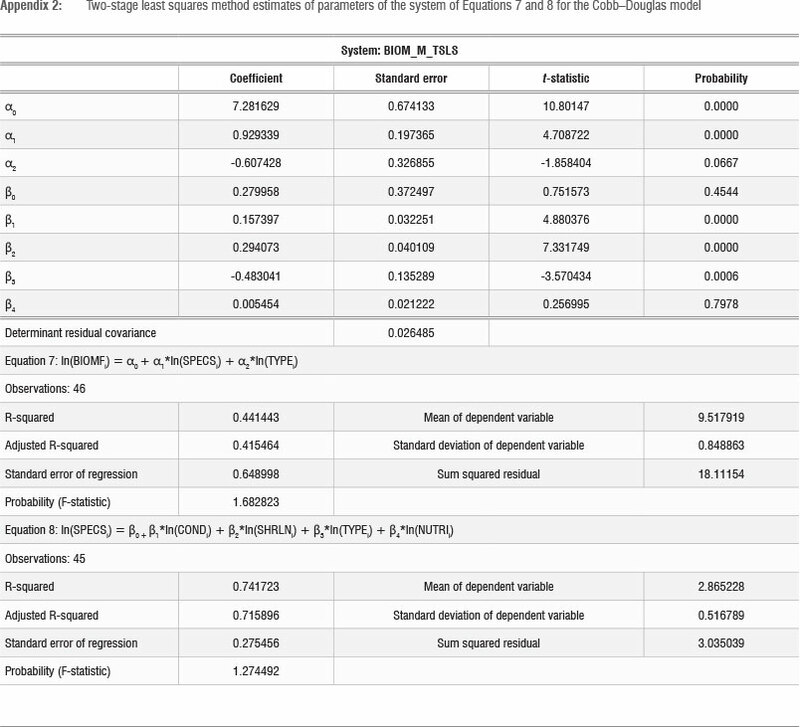 The fact that the variable SPEC appears on both sides of the system in Equations 7 and 8 implies an endogeneity problem and hence that an ordinary least squares estimation is not appropriate. A two-stage least squares (2SLS) procedure was accordingly employed to estimate the parameters of this system, which, unlike an ordinary least squares approach, yields consistent estimators of system parameters.39 Two functional form specifications were tested: the linear and Cobb-Douglas (double-log) forms. The linear function gave the best statistical fit. Results of the 2SLS estimation of the linear system are presented in Table 3. Results of the double-log function are reported in Appendix 2. The influences of all factors in the linear 2SLS model are of high statistical significance and all show the expected sign, i.e. direction of effect. Equation 7 relates the number of species (SPECS) and the estuarine type (TYPEi) to fish biomass (BIOMFi), and these two variables explained 43% of the variation in fish biomass (BIOMF). As expected, catch size of fish biomass in an estuary increases with increasing number of fish species at more than 99.9% confidence limit. This result is very important as it provides strong scientific evidence that biodiversity, as measured by species abundance, is positively correlated with biomass abundance, and thus the productivity of the estuarine system. Similarly, levels of fish biomass in an estuary are higher in larger estuaries with a higher degree of openness, as measured by the Whitfield physical classification index of estuaries (TYPEj was significant at a 99% confidence limit). Equation 8 measures the effects of estuary ecosystem component factors on fish species abundance, which explained more than 70% of the variation in fish species. The area of shallow sub-tidal flats (measured by shoreline length (SHRLN )), estuarine type (TYPE ) and the nutrient capacity (NUTRI ) of the estuary were all highly statistically significant variables. This finding means that larger estuaries with larger shallow sub-tidal flat habitats, higher degrees of openness and larger nutrient capacities will accommodate a richer diversity of fish species. Estuarine condition (COND) as measured by the Harrison-Whitfield multimetric estuary index, which uses a multiple of indicators, showed a strong positive correlation with species diversity and was significant at the 99.9% confidence limit. To derive marginal effects of estuarine ecosystem services on fish catches, one should bear in mind the direct and intermediate effects specified in Equations 7 and 8. 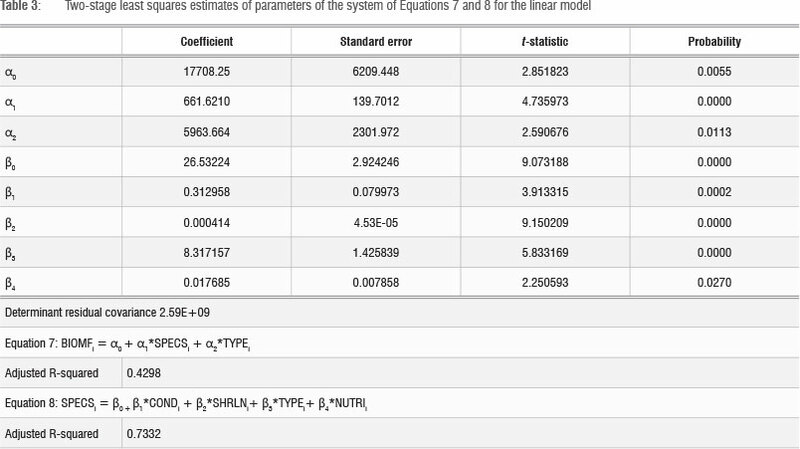 These are calculated in Table 4, based on parameter estimates given in Table 3. It is clear that the degree of openness and species diversity contribute the most to fish productivity. These estimates can be used to derive shadow values (accounting prices) of the estuary intermediate and regulating ecosystem services at fish catch prices. However, they overestimate the value of the marginal contribution of these services as our model - because of a lack of appropriate corresponding data - does not account for the effect of economic efforts (inputs) on harvest; but these estimates can be used as upper bound estimates. 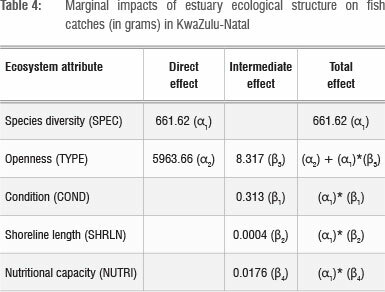 We have demonstrated how the production function approach can be used to measure the relationships between fishery activities and the compositional and functional elements of both estuarine and marine ecosystems, and we have used this approach to demonstrate how shadow values (accounting prices) may be estimated for KZN estuarine and marine ecosystems. We used available time-series and cross-sectional data sets that were independently collected on various compositional and functional components of the estuarine and marine ecosystem asset and fish biomass. A single equation ecological production function has been empirically specified to measure the functional effects of nutrient inputs on fish production in the marine system. In addition, a two-equation system of ecological production functions has been estimated to measure the effects of estuarine ecosystem composition and structure on fish production in the estuary. 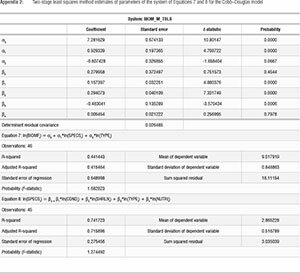 Using the SURE (Seemingly Unrelated Regression Equations) regression analysis method, the estimated system showed highly significant statistical performance and parameter effects consistent with scientific knowledge. The results provide compelling evidence, expressed in econometric terms, of the importance of estuarine structure and composition on fish biodiversity and production. Ultimately, such results are of great importance to estuarine management, harbour development and planning, and various other coastal sustainable development strategies and policies. There were, however, limitations to the study as a result of a lack of appropriate data. It is expected that seasonal effects related to, for instance, fish population size and rainfall events would explain a large component of the variation in fish production. The modelling of such relationships requires time-series data sets, which were not available. We also did not have access to appropriate data to control for the effects of economic efforts (e.g. economic inputs) on fish harvesting. Accordingly, we could be overestimating the marginal effects and accounting prices based on the derived estimates of the effects of estuary ecosystem assets structure and composition attributes in computing shadow values of their services. The results nevertheless hold several important policy implications. They demonstrate, through empirical evidence, how ecological degradation and changes in estuarine and marine ecosystems may indirectly affect a valuable industry. The results provide statistical evidence of the importance of ecological infrastructure and biodiversity for the fish production systems along the KZN coast. As tension between conservation of biodiversity and economic development is expected to increase in future, the need for evidence-based policy decisions will become greater. The current work demonstrates the benefits that could be derived from continued investment in long-term scientific monitoring programmes. It also demonstrates that existing databases may contain useful evidence of relationships between ecological infrastructure and the economy, and that decisions need not always wait for the results of controlled experiments. The production functions also demonstrate the importance of responsible coastal development initiatives. River impoundments, water pollution, harbour development and other coastal developments are all factors that influence fish production and thus the economy.18,40,41 Future developments should mitigate for their effects on ecosystem services. This knowledge can also greatly assist policymakers in the issuance of fishing permits. Conventional fisheries models use historical catch records and catch effort data to estimate fish stock sizes and also to control fishing permit conditions. This new knowledge introduces the possibility of using environmental variables as additional predictors of fish stocks. We would like to note, however, that the accentuated response to terrestrial-based nutrients applies only to fish stocks that are located in areas with significant terrestrial run-off into otherwise oligotrophic waters. Furthermore, elevated spawning does not necessarily mean elevated recruitment. A good spawning could be followed by poor survival of larvae, as their food requirements differ from those of adults; a shortage of suitable food items for early larvae could result in poor survival of recruits. Finally, a strong correlation between spawning intensity and rainfall-based nutrient input is implied, although not empirically proven. However, this work has demonstrated strong linkages between nutrient levels (using MAR as a proxy) and fish egg abundance and thus enables the investigation of run-off and rainfall-related climate change effects on KZN fisheries. We gratefully acknowledge Dr Allan Connell of the South African Institute for Aquatic Biodiversity for providing data for this study and for his input into various sections of this article. We also acknowledge Prof. Charles Breen and Dr Fred Kruger for their assistance in helping us understand some of the aspects of marine and estuarine biodiversity. We thank Transnet Ltd for their role in initiating this study. We are very grateful to Dr Stanley Liphadzi of the Water Research Commission for the financial support provided for this work. J.C.G. is the primary author and performed the data mining, production function specification and econometric analysis; R.M.H. assisted in writing the manuscript and the econometric analysis.